No more looking in the “bottom drawer” for all of the of cleaning supplies you’ve accumulated. If you’re serious about playing, then you are also concerned about the quality coming from your horn. BlowDry Brass eliminates all the clutter and gives you a clean, consistent playing horn every time you play. Let’s face it, as musicians the satisfaction is in the performance and not the maintenance. 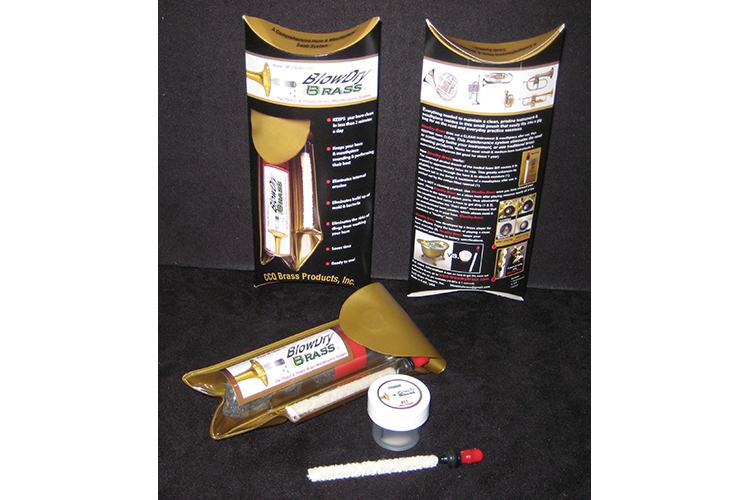 Why spend your valuable time cleaning your horn when you can simply use BlowDry Brass? A horn slowly accumulates a build-up of degraded valve oil, slide grease, and other composites (food residues, etc.). Putting a physical object through an instrument in this state will likely move the “grunge” to areas that will cause more problems (sticky valves, plugged water key ports, etc.). 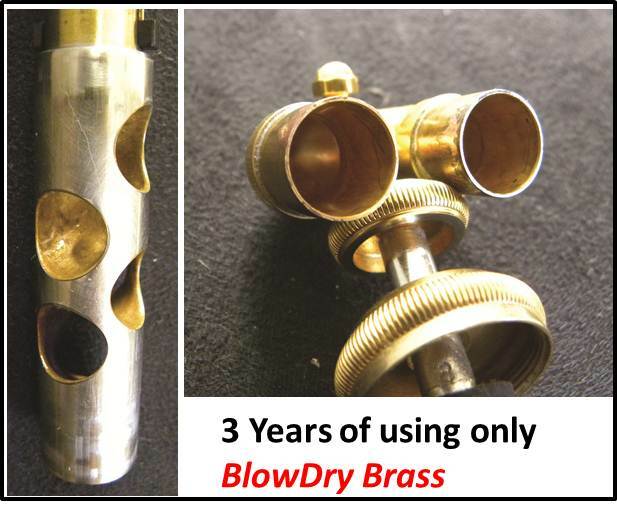 Using BlowDry Brass on a clean instrument after playing removes nearly all of the moisture in the tubing & piston ports, thus eliminating the conditions that cause an instrument to get dirty. Why add to the challenge of playing consistently by letting your instrument and mouthpiece increase their performance variability through the insidious residues that naturally build up from daily use? 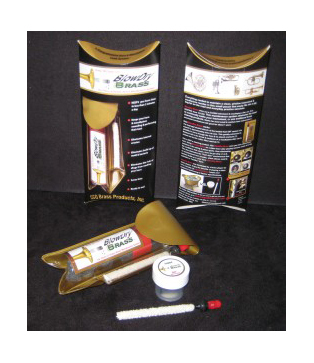 BlowDry Brass keeps your equipment performing to factory specifications. Dry mouthpiece: Insert ramrod into each end of mp (cup & shank end) to remove moisture. Squeeze out liquid (isopropyl alcohol) from the loaded foam BIT back into jar. Pinch & roll BIT to fit into receiver. Use ramrod to push BIT past receiver into lead-pipe. Extend all slides to stops or hold in place*. Cover bell with hand and SLOWLY blow the foam BIT through horn with all valves depressed**. Squeeze out moisture & repeat (1X valves open, 2X depressed). in loaded jar when it becomes dirty (1st time users will most likely experience black flux residues for about 3 to 5 weeks). Wash BIT with soap and water when replacing rubbing alcohol to achieve maximum absorbency (oil residues reduce the BIT’s ability to absorb liquid). Rubbing alcohol is available in 90-91% and 70-71% strengths at any drug store and most grocery stores. Ninety-one percent isopropyl alcohol is recommended and provides the best results. Dispose loaded BIT only after it degrades (3-5 weeks when used daily). Every 1-3 months, run water (warm works best) through entire horn opening & closing all valves and water key ports*. Ensure that a full stream of water comes out of each water key port (this is one area that may become plugged if this procedure is overlooked). 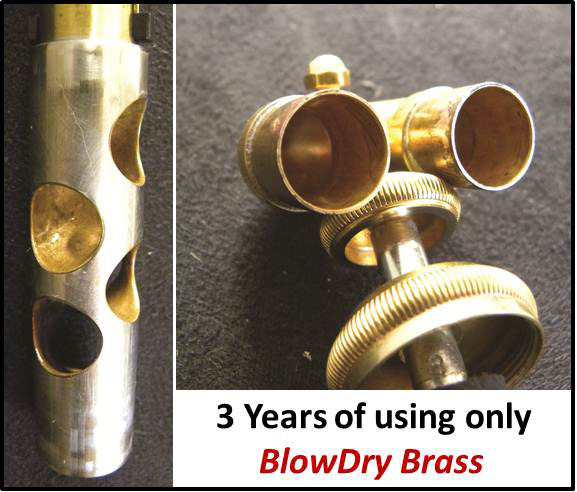 Blow excess water out of horn*, and finish by using BlowDry Brass. 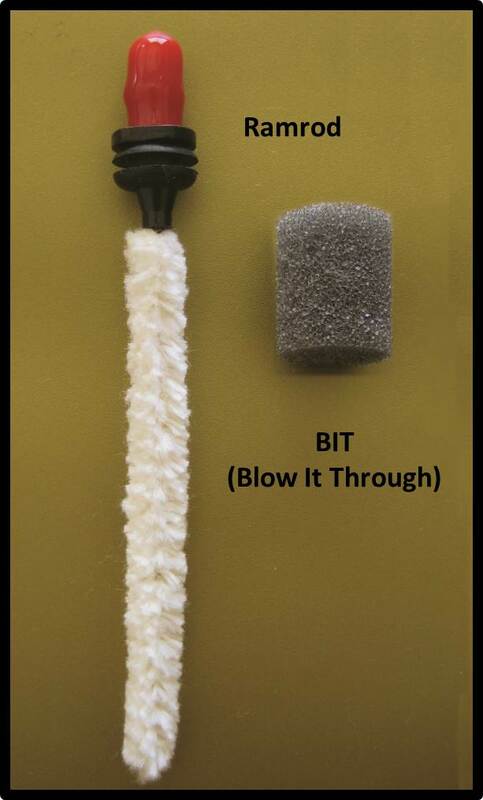 Remove and clean valve end caps (i.e., Q-tip swab). Oiling valves more frequently will be necessary when using BlowDry Brass. *Always hold slides when blowing BIT or water through horn. **Do not move valves while blowing BIT though horn.